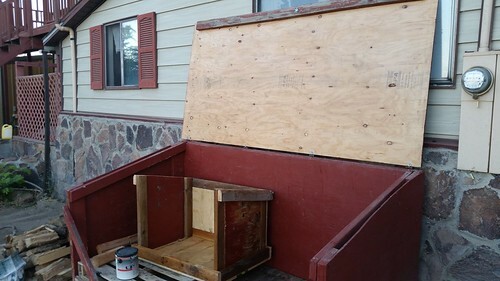 Lisa completed the lower portion of the new small wood box (the roof will be a separate piece added later) and that meant it was time to start painting. 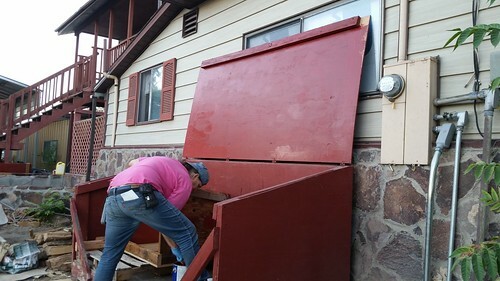 We moved the small box inside the large box and Lisa applied a coat of sanding sealer to the surfaces that would be repainted. After applying this undercoat to the small box and to the inside of the new large box roof, Lisa left it to dry overnight. 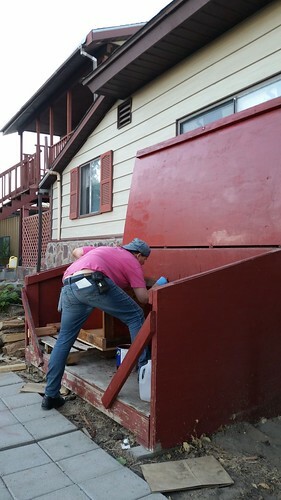 Yesterday evening, Lisa painted the underside of the new large box roof and started on the small box. I would just get in the way of her painting, so she had me read from one of our many railroad history books while she painted. There are bits she couldn't paint last night because there was too much risk of getting paint on the windows or walls of the house. She'll touch those up later. In these photos, there's a place on the large box roof in the lower right that looks to me like it's not covered, but this turned out to just be a bit of glare, as you can see in the photo below from today after the paint had dried overnight. As of this afternoon, here's how things stood. 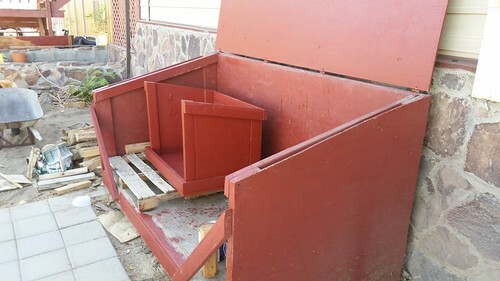 As planned, painting inside the wood box means that dripping paint isn't a problem. 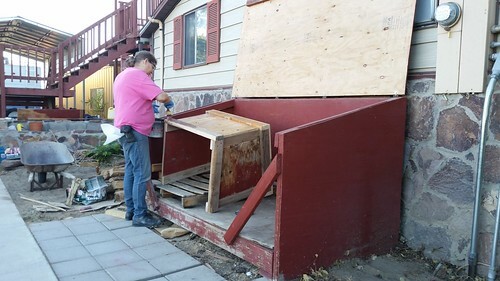 There's still work to be done on the large wood box, including painting those bits that couldn't be done without splattering the house, and Lisa also wants to do some repainting on the front porch, which does need it. The sun is very harsh here, and painted surfaces have to be redone regularly. (I'm really glad our house has metal siding.) This afternoon, I cut back bushes from the porch and scrubbed old peeling paint from the area that will be painted first. 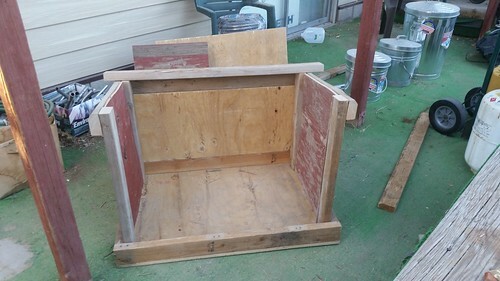 Lisa says she wants to first tackle the area where the small wood box will go, which makes sense because obviously that has to be done before we can put the box where it will sit for the winter.